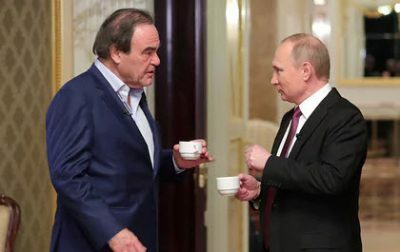 Just hours after Megyn Kelly announced on NBC’s Today show that she would be interviewing Vladimir Putin in St Petersburg tomorrow at the International Economic Forum, Showtime released the first trailer and extended clip for The Putin Interviews, a sit-down with the Russian president conducted by the film-maker Oliver Stone for a four-part special that premieres on 12 June. In the extended clip released on Thursday, The Guardian reports Stone and Putin can be seen driving in a car with an English translator in the backseat, discussing topics such as Edward Snowden’s whistleblowing and Russian intelligence. “As an ex-KGB agent, you must have hated what Snowden did with every fiber of your being,” Stone asks in the clip. Even though Putin condemned the NSA’s spy operation, he told Stone that Snowden shouldn’t have leaked the documents they way he did. “If he didn’t like anything at his work he should have simply resigned, but he went further,” Putin said in a clip of the interview released Saturday. Stone recently took to Facebook to express his views on Trump and Putin.